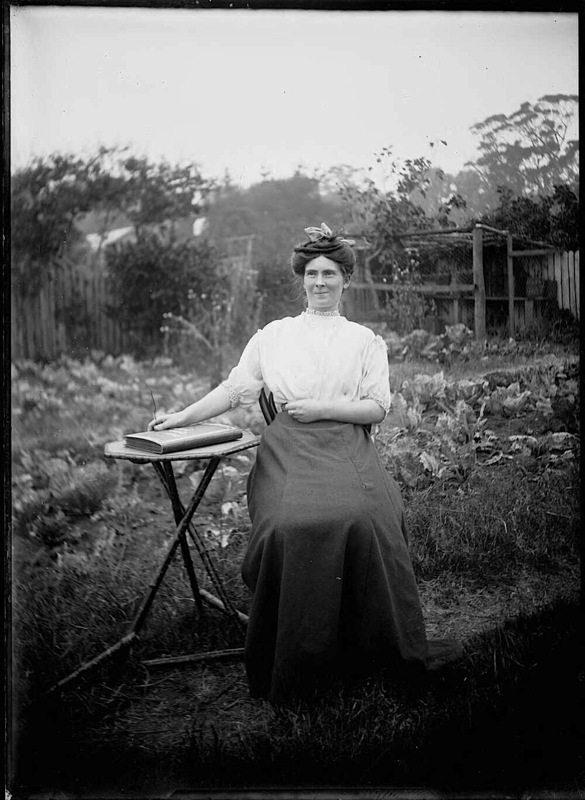 “Charlie Ferguson’s sister,” Tilba Tilba, New South Wales, ca. 1895, by William Henry Corkhill, via Trove of the National Library of Australia. I love this formal pose in front of a vegetable garden — and it’s very typical of the photographer’s work. 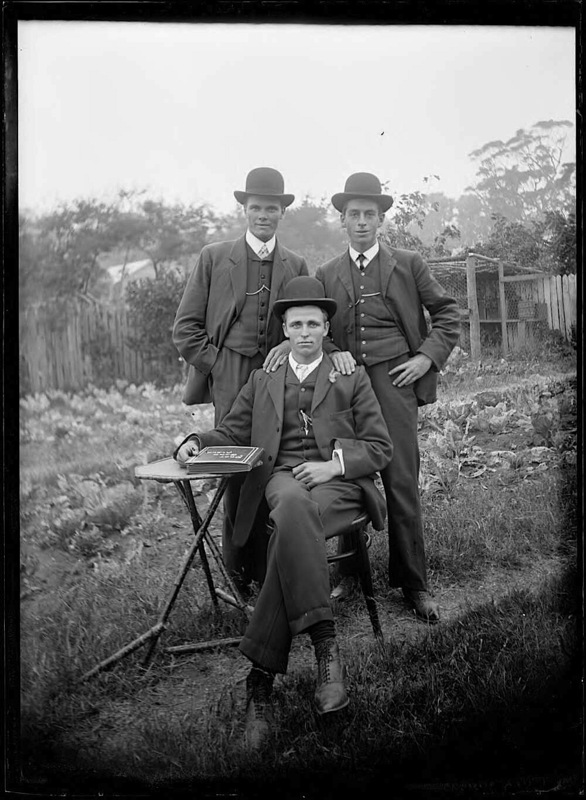 “Charlie Ferguson and William (Wallaga) Arthur Mead with an unidentified man. Click to enlarge. Corkhill was an amateur who took thousands of pictures of his prosperous dairy farming community between 1890 and 1910. His images were rediscovered in 1975, when his daughter gave his surviving glass plate negatives to the National Library. Among the 840 that could still be printed were portraits of family and neighbors of a “special intensity and intimacy,” according to the book, Taken at Tilba. For the natural light, Corkhill had to work outside, in gardens and farmyards. But he often posed his subjects as if they were in a studio, with small tables, chairs, and books. His backdrops were sometimes shrubs and flowers, but he also seemed satisfied with rough fences, water tanks, or the space between two farm sheds. Occasionally, the sitters look a little amused by the process, but the photographer’s approach is not ironic. “Corkhill’s familiarity with and affection for his subjects is evident . . . and imbues his photographs with a strange combination of authority and informality. He has a rather casual approach to the backgrounds in his portraits, as if his familiarity with the scenes he records makes him impervious to some of their oddities,” according to his biography on the Library’s website. You can click on the linked titles below to see more of his pictures, or you can browse through the online catalog here.